We wanted excitement, and Formula 1 delivered in the very first race with plenty of drama and the hint of a threat to the dominance Mercedes enjoyed last year. Next stop, Bahrain on 3 April. Exciting stuff to come from Jolyon Palmer? He didn't looked fazed at all on his F1 race debut and was involved in a good tussle with the two Toro Rossos as he went on to finish an impressive 11th. Renault's straight line speed was encouraging as well. I still can't believe that Fernando Alonso walked away from this completely unscathed. "It was a scary moment," he said. "I feel lucky to be here. It's because of our safety standards that I am still alive." Just got up, here's a few bits for you to read while you have your morning coffee. A podium was not to be for Max Verstappen, who had started the race fifth but finished 10th. He provided plenty of entertainment for listeners with his increasingly frustrated radio comms. Not sure how well they will have gone down with his team though. Jon Bennett: @RGrosjean amazing performance today, proving he's one of the best in F1. @HaasF1Team really deserved that. David NicholsonHirst: Rosberg wins by default again! Won't be like that all season. Street races is only way he can win! Long season! Earnest Libertine: What a race, how spectacular, in every way! The usual result is really not indicative of how competitive it was. Brilliant! Haas are the first new team to score points on their debut since Toyota in 2002, when Mika Salo finished sixth in Australia. Here is the man himself with our very own Allan McNish. Romain Grosjean, who took Haas to sixth place on the team's debut, tells Sky Sports: "It feels like standing on the top step of the podium. From day one I told these guys the car has huge potential. We have plenty of areas where we can improve but the result is a massive boost for everyone." McLaren's Jenson Button on Sky Sports: "I saw the incident with Fernando Alonso back and I'm amazed he walked away. It shows how far we've come with the cars in terms of safety." Fourth-placed Danuel Ricciardo of Red Bull on Sky Sports: "Fourth is great but I'm probably more happy with the pace we had. We finished a fair step ahead of Williams and our competitors." 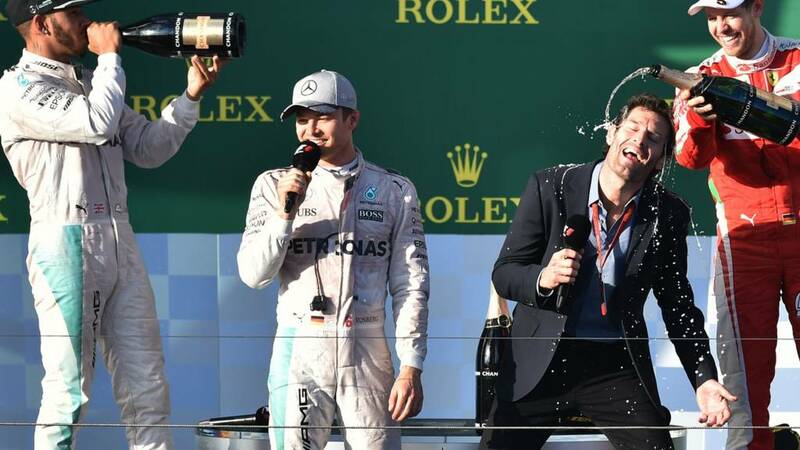 Video caption: Mercedes' Nico Rosberg takes victory in the opening race of the season.Mercedes' Nico Rosberg takes victory in the opening race of the season. Rosberg wins 31 years after his dad did in his awesome aviators. Keke won the inaugural Australian Grand Prix in Adelaide in 1985. Third-placed Sebastian Vettel: "I went for it so obviously the start was mega. I was very happy - it reminded me of Hungary last year. We settled into a rhythm nicely. You can argue the red flag didn't help us. We tried to go more aggressive, maybe it didn't work but ultimately I'm very happy with third. "It’s a shame I don't have you as a team-mate anymore," he tells his former Red Bull colleague Mark Webber at the end. Hope poor Kimi Raikkonen wasn't listening.